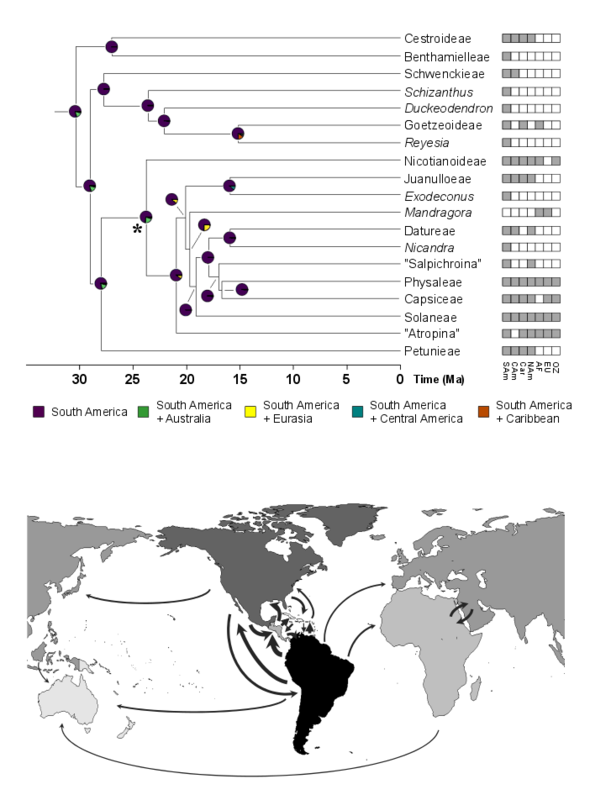 For Solanaceae, we examined how biogeographical events (e.g., vicariance, founder events, and dispersals) in the context of time and space contributed to the widespread distribution of the family. We found that South America is Solanaceae’s current center of diversity and its ancestral range. The main type of biogeographical event that drives the evolution of geographical ranges in the family is dispersal events between areas, and these were most common in range expansions from South America into North and Central America. Dispersals from South America to other areas, in general, were more common than in the opposite direction. This directionality is likely due to the early build-up of species number in South America, resulting in large number of potential dispersals from that area. This study presented the first phylogeny of the tribe that includes all accepted species to date. This phylogeny was estimated using nuclear markers, which have been useful in increasing the resolution of other clades within Solanaceae. As part of this study, we also reconstructed the history of morphological characters used to delimit genera in the tribe, such as flower position and size, and fruit type. The patterns of character evolution were largely consistent with the phylogeny, meaning that only minimal taxonomic changes were needed. Specifically, we reassigned a species that was currently placed in a different tribe within Solanaceae to Datureae and elevated it to its own genus - Trompettia J. Dupin. We integrated historical and environmental factors to create a more detailed picture of how this clade colonized different parts of the Americas. Our results suggest that Datureae originated in Andean regions and subsequently expanded its range to North America and non-Andean regions. Moreover, I estimated that the ancestral environmental niche in the tribe is dry and that there has been a significant shift along the Brugmansia branch towards a more mesic type of environment. The long-distance dispersal to North America represented a range expansion into a familiar type of environment, a dry one. 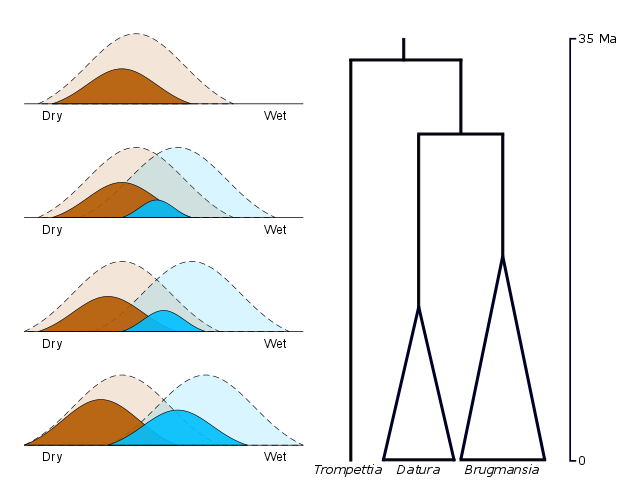 Even though range expansions ultimately resulted in a significant niche shift, our niche overlap estimates showed moderate overlap remains between Datura and Brugmansia niche regions. This is likely a result of as yet incomplete niche specialization within Brugmansia and two Datura species. We explored the anatomical differences between fleshy and dry fruits in the group, with special attention to the transition to the family's ancestral fruit state observed in one of the genera in the tribe (Datura). 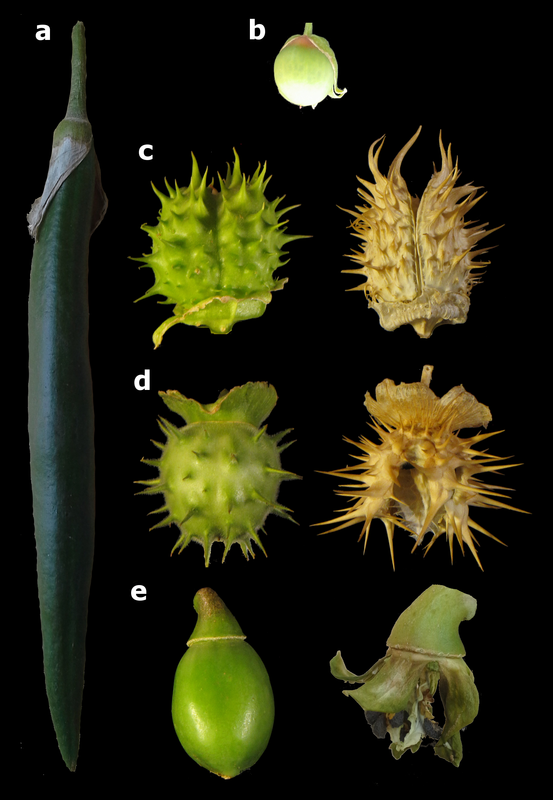 In addition to comparing the anatomical features of fleshy and dry fruits in the tribe, we explored the characters that could explain the different dehiscence mechanisms within species in Datura, including biomechanical tests of regular and irregularly dehisced fruits. Lastly, we placed these results into phylogenetic context to determine if the transition between berries and regularly dehisced capsules was a stepwise process, given the number of traits likely required for a dry fruit (e.g., creating dehiscence zones, opening to release seeds). We found that, while capsules and berries in Datureae are functionally different, there are overlapping anatomical characters between the two types of fruit. We also found that the vascular tissue is likely a major player in the dehiscence mechanism in Datura, in contrast to the mechanism seen in other genera with capsules in Solanaceae. 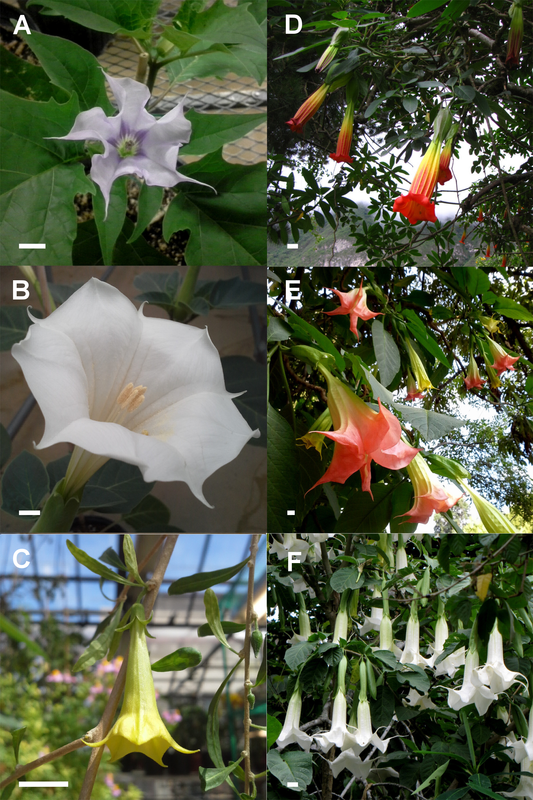 These results demonstrated then the relevance of phylogenetic context when discussing the evolution of characters, and indicate that multiple mechanisms for the development of capsules exist within Solanaceae.